So you’re trying to get rid of patellar tendonitis, but because some pain is always there, you’re not sure how hard to push yourself during rehab or training. You don’t want to cause a setback. I had this problem and many people in my courses share similar stories. If this applies to you, you’re definitely not alone. Here’s how you can handle it. In a perfect world, you’d never train through pain and avoid all painful activities, but let’s be real here, with tendonitis, that’s just not possible and even academic research found that pain during tendonitis rehab is common. Sometimes you can’t avoid pain, but to protect your knees, you need to know whether it’s acceptable pain or not. This three-point checklist will help you decide. Question #1: Is it unfamiliar pain? Of the people I work with, everyone describes their pain a little bit differently. You know what your tendonitis feels like and you will know if what you’re experiencing during training is a new or more intense type of pain. Maybe it’s a new injury or maybe your tendon has become irritated, but either way, it’s not safe to push through this new type of pain. If the new pain doesn’t go away again, you definitely need to see a doctor about it. 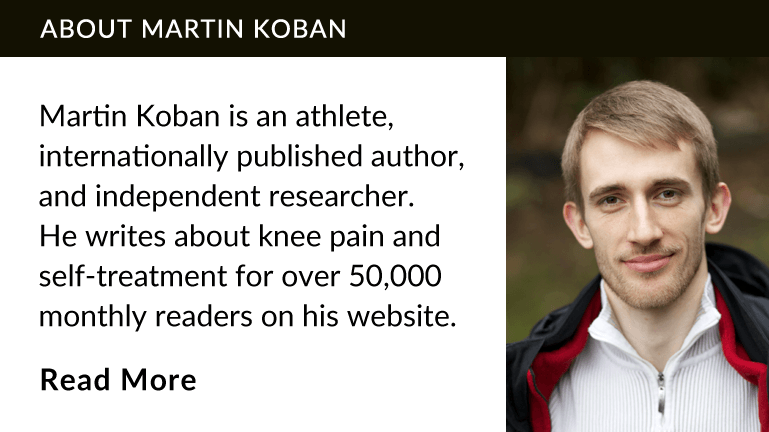 Question #2: Is your knee is irritated? Don’t train through pain if you’re in this second state. Expert tendonitis clinician Dr. Peter Malliaras points out that in his experience, once irritated, a tendon can stay irritated for weeks, so you definitely need to avoid irritation and this checklist can help you with that. Question #3: Are you doing something unplanned? This third question is even more important than the other two. Let me explain. I tell everyone I consult to write their workouts and pain levels down, because that’s necessary for discovering exactly how fast you can increase rehab or workout intensity without risking setbacks. To beat tendonitis, you need a training or rehab schedule that gently increases in intensity from week to week. This slow increase is necessary, because tendons absolutely hate sudden changes in training volume or intensity. Once you’ve found an exercise routine that leads to a reduction in pain, celebrate, and then base future workouts on the progression speed that has worked for you in the past. A rule of thumb is never to increase overall training intensity by more than 10% per week, but even that may be too much. It’s not safe to push through pain if you’re deviating from what has worked for you in the past. Don’t get me wrong. It’s okay to work towards a lofty goal, but you want to be doing in in small increments that you know to be safe from past experience. Jumping ahead is dangerous, because it may lead to a setback, costing you weeks of recovery time. Usually, this happens when people get too ambitions. For example, someone may switch from 2 sets of 10 repetitions in one rehab session to 3 sets of 15 repetitions in the next one. That’s asking for a flare-up. The same applies to how much time you spend doing your sport per week. Big jumps in training time are risky, especially if you have a history of knee pain. Doing too much is about as tempting as having your favorite piece of cake on a plate right in front of you when you’re trying to lose weight, BUT it’s a great opportunity to exercise your willpower muscle. If you answered “yes” to any of these questions, it’s not safe to train through pain. Here’s what you can do next. 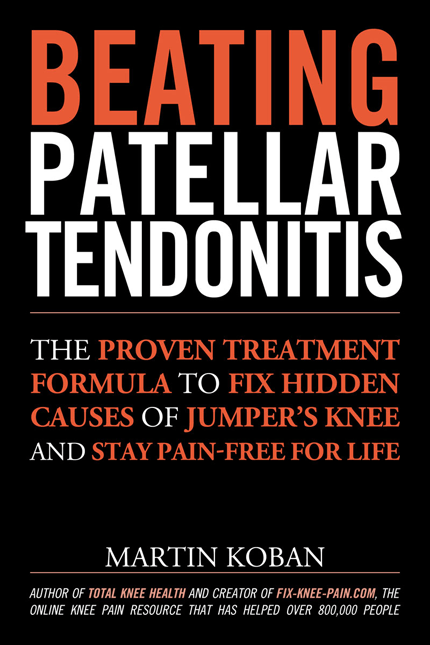 If you want strong knees and legs, sign-up to my free course on getting rid of tendonitis by going to Fix-Knee-Pain.com/tendonitis. About 11 thousand people have signed up already and one of the things we’ll cover in the course is how you can stop the pain permanently. Adams, Douglas J.; Mazzocca, Augustus D.; Fulkerson, John P. (2006): Residual strength of the quadriceps versus patellar tendon after harvesting a central free tendon graft. In Arthroscopy : the journal of arthroscopic & related surgery : official publication of the Arthroscopy Association of North America and the International Arthroscopy Association 22 (1), pp. 76–79. DOI: 10.1016/j.arthro.2005.10.015. Pope, David; Malliaras, Peter (2013): Lower limb tendinopathies. Available online at http://physioedge.com.au/pe-023-lower-limb-tendinopathies-with-dr-peter-malliaras/, checked on 9/12/2016.